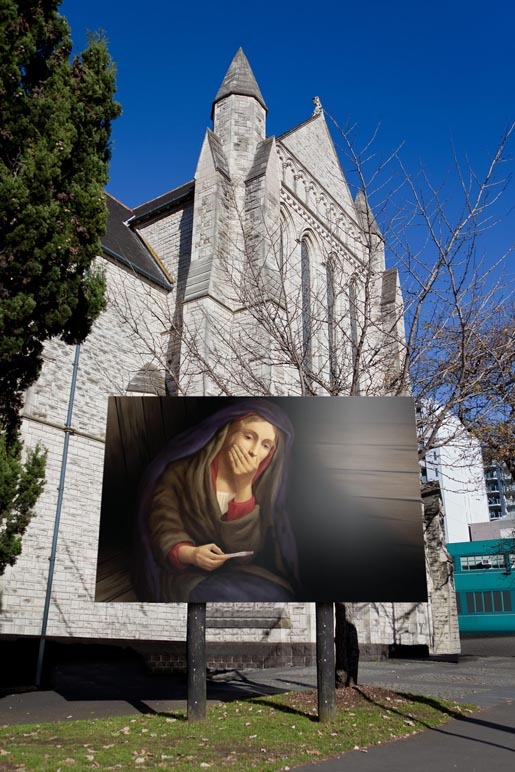 St Matthew in the City, the progressive Anglican church in Auckland, New Zealand, has hit the headlines again with “Mary Is In The Pink”, a controversial Christmas billboard. The billboard portrays Mary, Jesus’ mother, looking at a home pregnancy test kit revealing that she is pregnant. No words. The billboard, which was meant to be up until Christmas Day, has been vandalized by a Catholic protester, who removed the pregnancy test because he believed it was blasphemous. The Mary is in the Pink billboard was developed at Whybin\TBWA\Tequila, Auckland, by executive creative director Andy Blood, creatives Cece Chu and Ryan Price, post producer Michelle Hong and was illustrated by Elena Panaita.